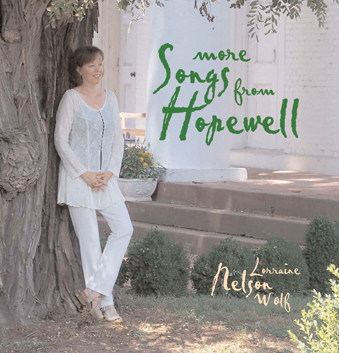 Description: Lorraine Nelson Wolf's new CD, More Songs From Hopewell: Take a journey from the pure anthemic joy of "Praise God (Doxology)" to the sweet simplicity of voice and piano in "I Can See God's Face". Biography: Lorraine Nelson Wolf is a versatile virtuoso. She has performed in the great concert halls, from Carnegie to the Kennedy Center, written songs, scores, reviews and themes, from “Silly, Silly Me” to the TV theme for NASCAR, recorded six solo CDs from “’Twas In the Moon of Wintertime” to “More Songs From Hopewell,” played in a dozen Broadway shows, from “Sweeney Todd” to “Grease,” accompanied everyone from Chita Rivera to Peter Allen, and received kudos from Billboard Honorable Mentions to a Parents’ Choice Award. A lifelong church musician, Nelson Wolf sings, composes, arranges, leads, conducts and playsharp, organ and accordion too, in addition to the piano and keyboards on this recording. More songs from the voice, piano, mind, heart and soul of Lorraine Nelson Wolf. More Songs From Hopewell, the follow-up to 2004’s Songs from Hopewell, is just as moving, but more modern. From the pure anthemic joy of “Praise God” to the sweet melodic simplicity of Lorraine’s voice and piano on “I Can See God’s Face,” there is more of what we expect from Nelson Wolfmore comfort, more inspiration, more answers, but even more questions. There are also more musiciansbassist Gordon Johnson, percussionist Val Michalski, singers Carol Ide, Peter Davis, the Hopewell Reformed Church Chancel Choir, Steve Ide, who also plays guitar, and guitarist Godfrey Nelson, who produced it all.